Albert David is a choreographer; dancer and teacher of contemporary dance and jazz, his creations incorporate both Aboriginal and Torres Strait Island styles. Albert was born in 1971 on Thursday Island in the Torres Strait; in 1989 he was accepted into the National Aboriginal Islander Skills Development Association (NAISDA) from which he graduated with a Diploma of Dance in 1994. Albert has choreographed video clips for various music artists such as Christine Anu, Neil Murray, and James Reyne; he also featured in TV commercials for Qantas and Coca-Cola and has modeled for Balarinji. Albert joined the Bangarra Dance Theatre in 1995 performing traditional Torres Strait and Aboriginal dance; he performed in the Company’s contemporary productions of Ochre’s, Fish, The Dreaming, and Rites (a collaborative work with the Australian Ballet). 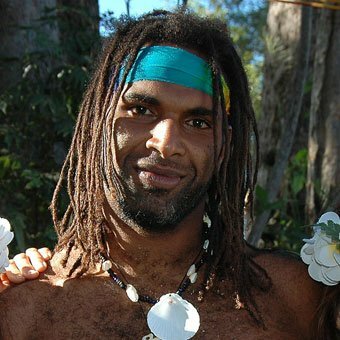 Albert has also performed in works by prominent choreographers such as Laszlo Seregi, Stephen Page, Kim Walker, Bill Pengelly, Raymond Blanco, Elizabeth Cameron, Virginia Ferris, Vienne Rogis, Jason Pitt and Astad Deboo, in 2007 he won best dancer at The Deadly’ s Aboriginal Awards at The Sydney Opera House. Choreographed performance at Parliament House for the 40th anniversary of the Aboriginal referendum for Descendance. Descendance in association with Native Canadian Dance Company “Red Sky”, sees Albert Tour and choreograph the show “Shimmer” throughout Canada, performances in Toronto, Vancouver, and the Banff Centre.